I have been wanting to read Brightly Woven for a long time; I don’t know why I put it off for so long! I had pretty high expectations, and this book met all of them. It isn’t going to stand out as an all-time favorite, but I definitely loved it. As I was reading, I realized that North was reminding me a lot of Howl, from Diana Wynne Jones’ Howl’s Moving Castle. And that is a pretty huge compliment! They have a lot of things in common, both plot and personality wise. It is kinda funny that North was always described as being gross, dirty and stinky and I still managed to develop a huge book crush on him. Apperantly I’m not too picky when it comes to wizards. He was a great character! Cudos to Alexandra Bracken. I absolutely adored Syd: she was tough, smart and stubborn as a mule. She cared a lot about her family, country and religion…and she went to great lengths to support her beliefs and ideals. Even when the going got tough, she was the one pushing forward and refusing to give up. Yay for strong female MCs! 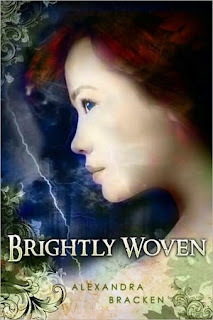 As far as the plot of Brightly Woven goes, when it involves fantasy (especially wizards) and a quest of some kind…I’m in. This really was a great story, I couldn’t put the book down once I got into it, and I loved the world that Alexandra Bracken created. She has definitely gained a fan, I can’t wait to see what she does next! I definitely recommend reading Brightly Woven by Alexandra Bracken! I have been thinking about buying this book for some time now and after reading your review I will get it soon.